Good news for Indian twitter users. Twitter has struck a deal with Bharti Airtel (the largest mobile carrier in India) which would allow Indian users to receive free twitter updates on the go. Twitter has already started promoting this deal. If you are an Indian, be prepared to be greeted by the following notification on the home page. If you are an Airtel subscriber, setting up your Twitter account is really simple. You can either do it from the Devices page or simply text START to 53000. Receiving SMS updates is completely free. However, standard text messaging rates (Re 1.00 per message in most cases) will apply for sending updates. Mobile updates were always an important aspect of Twitter. Initially, free updates were available almost all over the world. However, Twitter had to cut back on free SMS updates as many carriers started complaining about the large volume. Interestingly enough, I don’t remember Twitter disabling mobile updates in India. 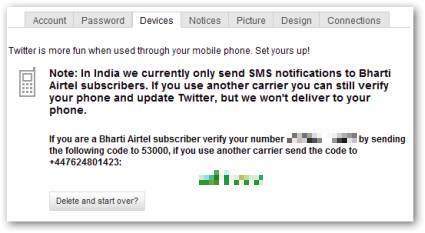 I may be wrong, but free SMS updates have always been available for Indian users. At least on paper, because the last time I had tried signing up for SMS updates I never received the verification message. Internet penetration in India is increasing at a rapid rate. The huge population coupled with a relatively untapped market represents a unique opportunity to most internet start-ups. And they are certainly beginning to take notice. Fairly recently, Facebook chose India to test Facebook Light and now Twitter has made it clear that they consider India to be an important market. A formal deal is good news because it ensures that updates will be free and available. .-= Shaunak DeÂ´s last blog ..Season’s Greetings Dr.Mallya =-. I think it would have been better if they have used a standard mobile no for sending updates (from user side). For people like me who have configured tariff plans to have cheap national sms it would have been more cost effective. A case in point is Facebook’s India mobile number. .-= Sujith AbrahamÂ´s last blog ..A software engineers Orkut Profile! =-. Is there a booster pack or anything available to get rid of the standard text messaging rate for tweeting ? .-= HariÂ´s last blog ..5 Scripts to Make your Facebook Sexier =-.